This year’s Rushbearing Festival attracted hundreds of spectators and saw the biggest procession in its history. The Rushcart - piled high with rushes - was hauled by 60 men wearing clogs through Sowerby Bridge and the surrounding vilages. 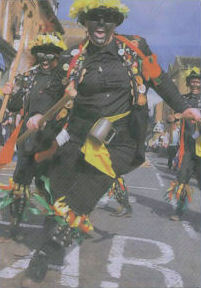 They were accompanied by colourful morris dancers, musicians and the Bradshaw Mummers. Among those taking part was one of the Calderdale festival’s founders Gary Stringfellow. 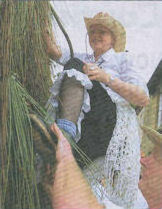 Now vice-president of the Rushbearing Association, he start­ed the event with president Fred Knights in 1977. He said every area has been asked to organise an event to mark the Queen’s silver jubilee. He had been researching the Rushcart and suggested a Rushbearing festival. Back then the event only lasted an afternoon but has now grown to an entire weekend. He said: “I’m delighted it’s still going, especially that It has been carried on by other people. Among the crowds was Jon Hirst, 51, from Sowerby Bridge, who said: “I’ve been several times and think it’s a great event. Hester and David Peters, 66 and 69, have been coming to watch the procession every year since moving to in Sowerby Bridge four years ago. 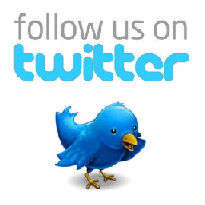 They say it is entertaining and encourages the community to join together. The festival sees the cart and its pullers stop at churches to present rushes and pubs for refreshments. 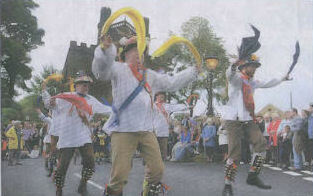 Rushbearing is a tradition that dates back centuries to the time when rushes were used to cover church floors. Once a year the church cleared out the rotten rushes and new ones were taken to the churches in carts. The modern Rushbearlng Festival sees the Rushcart travel through Sowerby Bridge, Warley, mangle, Sowerby and Ripponden.